The Russians defeat the Swedes at the Battle of Oravais. At the beginning of the war, Swedish forces had retreated to Oulu. They had then managed to repel the Russians and reach Savonia despite the capitulation of the fortress of Sveaborg by the end of summer 1808. Russia recuperated quickly, and by the end of August the Swedish army was again retreating northwards along the coastal road. To avoid being encircled, Colonel Georg Carl von Döbeln was sent in advance to Nykarleby with a brigade. The threat of encirclement was exaggerated, but the Swedish army was at this point showing signs of panic and collapse. On 13 September the army left for Oravais and it halted to await news from von Döbeln, who was fighting the Russians at Jutas. The sound of a cannon was heard in Oravais, and a brigade was sent to reinforce von Döbeln. The Russian main army had marched from Vasa in furious pursuit of the Swedish forces. The night before 14 September was spent in bivouacs along the road between Vörå and Oravais. The impulsive General-Major Yakov Kulnev’s troops had taken the lead and were the first to make contact with the Swedes. At dawn the first shots were exchanged between Kulnev’s troops and a Swedish outpost by a bridge in the forest. Firing intensified, the Swedish position was reinforced continuously while the remainder of the Russian forces behind Kulnev arrived. Fighting continued with heavy losses on both sides until the situation became untenable for the Swedes, who retreated to their defensive positions at 10 a.m. The retreat was covered by a single artillery piece commanded by the fifteen-year-old sublieutenant Wilhelm von Schwerin. The Swedish main position was deployed along a ridge which was protected to the north (on the Swedish right wing) by an inlet from the Baltic, and the Fjärdså stream with its south to north flow provided added defensive potential. The forest in front of the ridge had been cleared to afford the artillery a better view of the arriving Russians, who were regrouping at the edge of the forest. Artillery bombardment then began between the two forces, and continued for an hour until the Russians mounted a frontal assault against the Swedish positions. Kulnev, on the Russian left wing, struck the Swedish right, but was repelled when his force became bogged down in the Fjärdså stream. The Russians now reinforced their right wing, under Nikolay Demidov, and another assault was made. It was also repelled, but this time the Swedish unexplainably left their positions and counterattacked; Adlercreutz had issued no order to that effect. The Swedish counterattack met overpowering fire and was forced to withdraw with heavy losses. At 2 p.m. the battle was far from decided. The Russians made a second attempt at turning the Swedish left flank. This thinned the Russian center, and Adlercreutz ordered a forceful attack to exploit the weakness. Despite the intensive Russian fire, the attack proceeded swiftly, and the whole Swedish line was carried along by the movement. The entire Russian line was forced to retire back into the forest where the battle had begun earlier in the morning. However, dwindling of ammunition frustrated Adlercreutz’s attempted decisive stroke. As Russian reinforcements arrived, the spent Swedish army retired to their defensive positions again. At this point the battle was still undecided, but General Kamensky ordered Demidov’s right wing to make yet another attempt on the weak Swedish left wing. When this maneuver started night had fallen and the battle had raged for fourteen hours; it became too much for the Swedish army, which hastily retreated to the north. Pope Paul VI canonized the first American saint, Elizabeth Ann Seton. 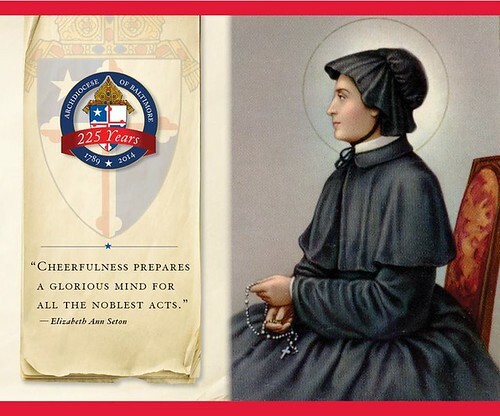 Saint Elizabeth Ann Seton, known as “Mother Seton,” is special to all Americans for historical, humanitarian and spiritual reasons. Though born in the New York City area, she lived in Maryland from 1809 until her death. Elizabeth Ann Seton was widowed at the age of 29 and left to care for her five children alone. Her late husband’s shipping business had been unstable, and money was scarce. In order to support her family, she attempted to establish a school but met with little success. To the dismay of her friends and relatives, she converted to the Catholic faith. With encouragement and assistance from John Carroll, the first Catholic Bishop of Baltimore, Seton came to Baltimore and established the first free school for girls in 1808. This school, which was the forerunner of the Catholic school system, soon outgrew its original location on Paca Street and moved to Emmitsburg, Maryland in 1809. Also in 1809, Seton founded the first American religious order for women known as the Sisters of Charity. This religious order, later evolved into the Daughters and Sisters of Charity. The order grew throughout the United States and expanded into several foreign countries. Beginning in 1814, Mother Seton and her religious daughters established schools, orphanages and hospitals throughout the world. On September 14, 1975, Pope Paul VI proclaimed, “Elizabeth Ann Seton is a Saint,” making her the first native born American to be canonized by the Roman Catholic Church. The National Shrine of Saint Elizabeth Ann Seton is located in Emmitsburg, Maryland. The Microsoft Corporation releases Windows ME. With the help of the CIA, Mobutu Sese Seko seizes power in a military coup in the Congo, suspending parliament and the constitution. The British Empire adopts the Gregorian calendar. To do so, they skip eleven days. The 25th President of the United States, William McKinley, dies after an assassination attempt a week earlier. The Major League Baseball this season is canceled because of a strike by the players. A Soviet bomber drops a 40 kiloton atomic bomb north of Totskoye village, exposing some 45,000 soldiers and 10,000 civilians to nuclear fallout as part of a nuclea testing program.